Get great discount on Adata Dashdrive HD710 2 TB Wired External Hard Disk Drive | Online India shopping best deals, discount,coupons,Free offers. The DashDrive��� Durable HD710 external hard drive has arrived, providing mobile, rapid, and dependable data access in a rugged and sporty package. The housing of the HD710 is comprised of a unique silicone material, and the drive incorporates military-grade shockproof and waterproof (IPX7) construction with an ultra-fast USB 3.0 interface. Its lively outlook and dynamic design match the requirements and style of sports and outdoor enthusiasts, with color options including blue, yellow, and black. The USB cable tucks into a wrap-around exterior slot in the drive casing, providing an elegant storage solution that matches the highly practical characteristics of the device. 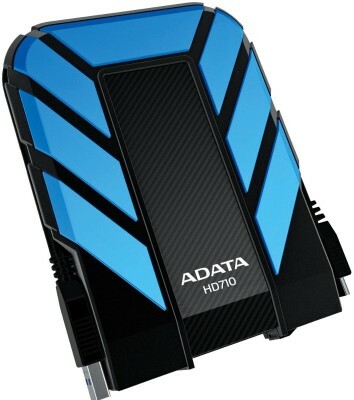 The DashDrive��� Durable HD710 2.5��� external hard drive features a bright cold-blue LED indicator that shines through the enclosure to indicate power and data transfer status..The product Adata Dashdrive HD710 2 TB Wired External Hard Disk Drive is from the famous brand Adata. The product is currently available with the amazing discount from FlipKart.Currently a discount of 30.0% available for this product. Great discount for this product which has the original price of Rs.12250.0 and you get these amazing products for a discounted price of Rs.8490.0. Hurry up. Stock may be limited.